A few days ago, a Master of Arts, who is still a young man, and therefore the recipient of a modern education, stated to me that until he had reached the age of twenty he had never been taught anything whatever regarding natural phenomena, or natural law. Twelve years of his life previously had been spent exclusively amongst the ancients. The case, I regret to say, is typical. 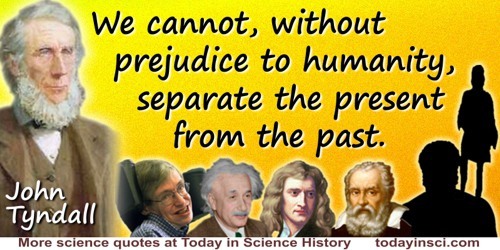 Now we cannot, without prejudice to humanity, separate the present from the past. 'On the Study of Physics', From a Lecture delivered in the Royal Institution of Great Britain in the Spring of 1854. Fragments of Science for Unscientific People: A Series of Detached Essays, Lectures, and Reviews (1892), Vol. 1, 284-5. In London Daily Telegraph (22 Jan 1878). Reprinted in English Anti-Tobacco Society and Anti-Narcotic League, Monthly letters of the Committee of the English Anti-Tobacco Society and Anti-Narcotic League 1878, 1879, 1880, (1 Feb 1878), 85.